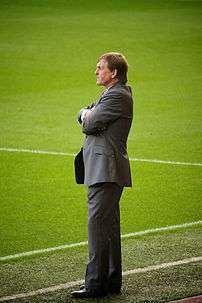 Kenny Dalglish temporarily served as the caretaker manager of Liverpool in 2011, following the sacking of Roy Hodgson. He was eventually promoted to full-time manager. In association footballing terms, a caretaker manager is somebody who takes temporary charge of the management of a football club, usually when the regular manager is dismissed, or leaves for a different club. However, a caretaker may also be appointed if the regular manager is ill or unable to attend to their usual duties. Caretaker managers are normally appointed at short notice from within the club, usually the assistant manager, a senior coach, or an experienced player. In other sports, the term "interim manager" is more commonly used. If a caretaker proves to be particularly successful during their spell in charge, they are sometimes given the manager's job full-time. Glenn Roeder was appointed full-time manager of Newcastle United after having taken over as caretaker following Graeme Souness' dismissal in 2006. This also occurred when Ricky Sbragia got the Sunderland job permanently after Roy Keane's resignation in November 2008 but he resigned himself at the end of the season 2008–09. This also happened in the 2010–11 Premier League; on 8 January 2011, Roy Hodgson was sacked by Liverpool after a run of poor results, and with Liverpool languishing in 12th place. Kenny Dalglish was appointed the caretaker manager of Liverpool for the remainder of the season. After an impressive run of results, which saw Liverpool rise to 6th on the table, Dalglish was appointed the full-time manager of Liverpool, on a three-year contract. In Norway, a notable example occurred in 2006 when Rosenborg BK manager Per-Mathias Høgmo announced he was taking a leave of absence in mid-season, citing health concerns. At the time, Rosenborg were ten points behind leaders SK Brann. His assistant Knut Tørum was appointed on an interim basis, and proceeded to lead Rosenborg to a furious comeback, clinching the league title with one match to spare. Høgmo announced his resignation two days after Rosenborg clinched, and Tørum was named permanent manager after the season. On the other hand, Tony Parkes was named caretaker manager of Blackburn Rovers on six separate occasions between 1986 and 2004, without ever being given the role in a full-time capacity. He is still yet to be given a full-time managerial role. Guus Hiddink was caretaker manager of Chelsea in 2009, leading his team to the semi-final of the UEFA Champions League where they shut out FC Barcelona at Camp Nou and tied them back at Stamford Bridge (the latter being a very controversial game, the match official being Tom Henning Øvrebø, with Chelsea eliminated on away goals), and finished off his tenure with the team as they won the FA Cup The club was reported happy to have Hiddink as manager even on a temporary basis.